Transcription of a letter from the Amos Adams Lawrence Collection, Massachusetts Historical Society. 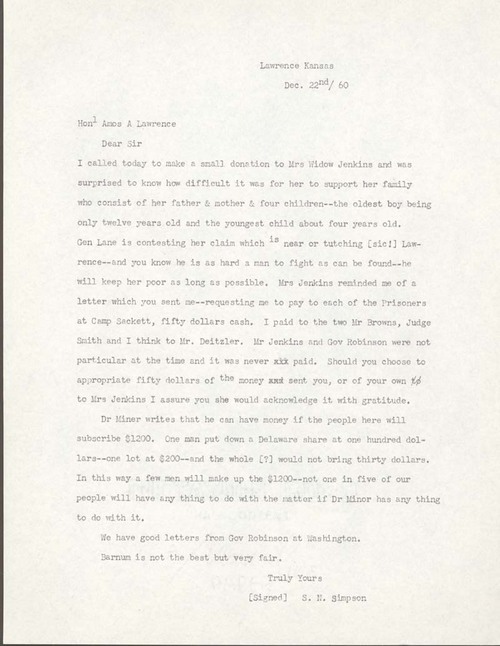 Samuel N. Simpson wrote from Lawrence, Kansas Territory, to Amos A. Lawrence in Massachusetts regarding the poverty in which Gaius Jenkins' family found themselves. James Lane had killed Jenkins in 1858 over a land claim, and it appeared that he was now taking measures to "keep her [Mrs. Jenkins] poor as long as possible." Simpson reminded Lawrence of his request to pay Jenkins fifty dollars as compensation for his imprisonment by federal troops at Camp Sackett, near Lecompton, in 1856. Jenkins had declined the payment at the time, but Simpson now solicited it on behalf of his widow and family.